“I hope that we shall ponder with subdued feelings the talks to which we have listened. I hope that we will quietly reflect on the wonderful things we have heard. I hope that we will feel a little more contrite and humble. “All of us have been edified. The test will come in the application of the teachings given. 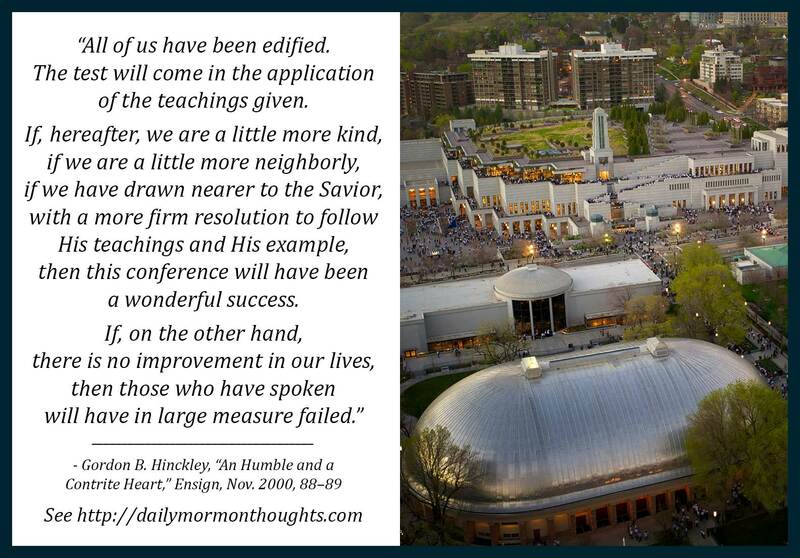 If, hereafter, we are a little more kind, if we are a little more neighborly, if we have drawn nearer to the Savior, with a more firm resolution to follow His teachings and His example, then this conference will have been a wonderful success. If, on the other hand, there is no improvement in our lives, then those who have spoken will have in large measure failed. “Those changes may not be measurable in a day or a week or a month. Resolutions are quickly made and quickly forgotten. But, in a year from now, if we are doing better than we have done in the past, then the efforts of these days will not have been in vain. "And perhaps out of all we have heard, there may be a phrase or a paragraph that will stand out and possess our attention. If this occurs, I hope we will write it down and reflect on it until we savor the depth of its meaning and have made it a part of our own lives. 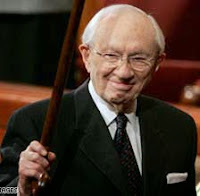 President Hinckley's comments and advice were always so practical and down-to-earth. 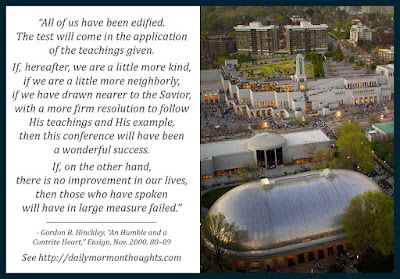 I think this reflection on general conference and its impact is a wonderful example of that. He begins by encouraging us to "ponder with subdued feelings" and "quietly reflect" on the messages. We certainly would be blessed to do more of that. And then some more very practical counsel. We aren't going to remember everything from the messages. But we should look for short thoughts or even phrases that stick out, and cling to them. Perhaps that is exactly the message the Lord wants to get through to us. When we make that concept a part of our life, then we will be blessed. In addition, we should know that much good will come as we read, ponder, and discuss the messages. "You will find many things that you missed when you listened to the speakers." That's a true promise! The impact of a general conference is only as powerful as we allow it to be. Implementing these suggestions will certainly enhance the experience.